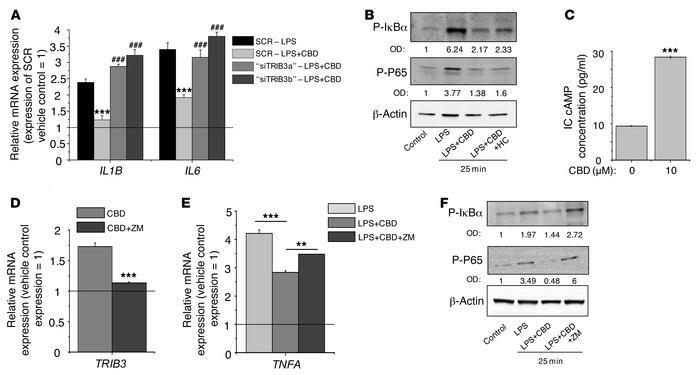 Antiinflammatory actions of CBD are coupled to A2a receptor-dependent upregulation of TRIB3 and subsequent inhibition of the P65-NF-κB signaling. (A) IL1B and IL6 mRNA expression following 5 μg/ml LPS treatment with or without 10 μM CBD (24-hour treatments started at the day 2 after the transfection). ***P < 0.001 compared with the corresponding CBD-free treatments. ###P < 0.001 compared with the SCR group receiving the same treatments. “siTRIB3a” and “siTRIB3b” mark 2 different siRNA constructs against TRIB3. (B) Western blot analysis of lysates of SZ95 sebocytes treated with 5 μg/ml LPS, 10 μM CBD, and 1 μM HC for 25 minutes. (C) Determination of the intracellular cAMP concentration following 1-hour CBD (10 μM) or vehicle treatment. Data are presented as mean ± SEM of 3 independent determinations. One additional experiment yielded similar results. (D and E) TRIB3 and TNFA mRNA expression following the indicated treatments (5 μg/ml LPS, 10 μM CBD, and 10 nM ZM). (A, D, and E) Data are presented using the ΔΔCT method; PPIA-normalized mRNA expression of the vehicle control was set as 1 (solid line). Data are expressed as mean ± SD of 3 independent determinations. One additional experiment yielded similar results. (C–E) **P < 0.01, ***P < 0.001. (F) Western blot analysis of lysates of SZ95 sebocytes treated with 5 μg/ml LPS, 10 μM CBD, and 100 nM ZM for 25 minutes. (B and F) Numbers on the OD row indicate the optical density of the P-IκBα and P-P65 bands normalized to the corresponding β-actin signals.